What do we know about fiber? There has to be more of a benefit than the fact that it helps you go number 2, right? While this is a well-known health benefit of fiber, there are indeed several other benefits to eating a fiber rich diet, such as helping to maintain a healthy appetite and aiding in the avoidance of some cancers, heart disease, and diabetes. Not to mention the fact that fiber comes from plants such as beans, grains, fruits, and vegetables and therefore contains little to no calories. There are two different types of fiber, soluble and insoluble fiber. Shall we break it down? Soluble Fiber: Soluble fiber is made of polysaccharides and dissolves in water. Therefore, soluble fiber forms a gel when mixed with liquids. Insoluble Fiber: Insoluble fiber is largely made up of plant cell walls and is not dissolvable in water. Therefore, it remains relatively intact when passing through the intestines. 1. Because fibrous foods take a bit longer to chew to comfortable swallow size (think celery), it tends to slow the eater down. Slowing down gives your mind and body time to synch up and realize, “Okay, I’ve had enough…I’m full now.” When we eat fast, we tend to overeat before our mind can tell our stomach to lay off the food. 2. High fiber foods tend to absorb a lot of water. Just like a scrunched up paper straw wrapper, when water fills it, it expands. (Oh come one, like you’ve never done the straw wrapper snake trick before)! Because of this absorption and expansion, it fills room in your tummy causing you to feel full for longer periods of time. This means you won’t eat more meals than your body actually required calorie wise. Helping Diabetics: Fiber itself is a form of carbohydrate that does not actually get broken down in the body. For this reason, it has no caloric intake. In fact, fiber (especially soluble fiber) acts in a similar manner as foods with a low glycemic index, causing it to have little effect on blood glucose level. In fact, fiber actually helps to control blood sugar levels. So how does this help? Fiber rich foods are great for satiating the appetite without spiking the blood sugar. Note: Remember, fiber is different from simple carbs. 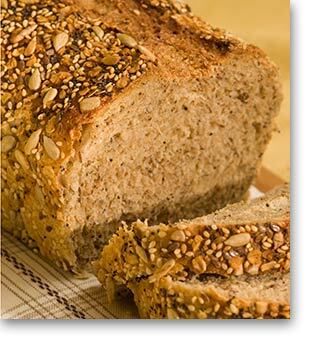 When picking out foods such as bread, be sure to make sure it is high in dietary fiber. Otherwise, you will be consuming simple carbs that will be sure to spike your blood sugar! Preventing Heart Disease: Soluble fiber has been shown to lower blood cholesterol in the body. The processes is rather scientific but in short, (very short), fiber slows the absorption of bile in the intestines. In response, the liver uses cholesterol to produce more bile salts to make up for this slowing down of absorption. The end result, LDL cholesterol is pulled from the blood. Aids in Digestion: Yes, we all know fiber aids in digestion. Fiber helps to keep stool soft so it requires less effort to use the restroom. This means no hemorrhoids. Moral of the story? Maintaining a fiber rich diet means maintaining a healthy weight, healthy heart, healthy digestive system, and several other benefits! Now I’m not saying make sure you eat a fiber only diet, just make sure you get plenty of fiber in your overall diet. This entry was posted in Nutrition Facts and Tips and tagged carbohydrates, Diet, fiber, fruit, grains. Bookmark the permalink.